Item # 135758 Stash Points: 7,999 (?) This is the number of points you get in The Zumiez Stash for purchasing this item. Stash points are redeemable for exclusive rewards only available to Zumiez Stash members. To redeem your points check out the rewards catalog on thestash.zumiez.com. Update your watch collection with a clean black case with red accents plus a shock, magnetic, and 200 meter water resistance for durability. 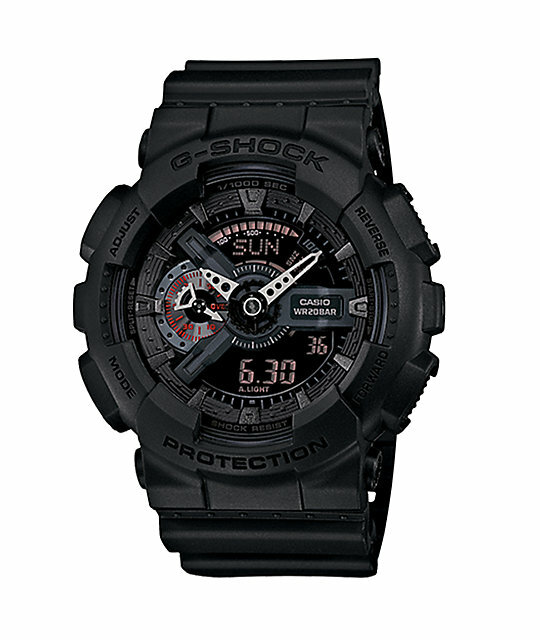 Shock, magnetic, and 200 meter water resistance. 1/100th second stopwatch with speed indicator. World time and full auto calendar. 4 daily alarms with flash alert. Approximately 2 years battery life. 55 x 51.2 x 16.9mm/ 72g weight.